As we approach the end of the year, how is your 2016 52-week challenge? Is it going well?Are you on-track? Are you off-track? What will you do differently for next year’s saving challenge? 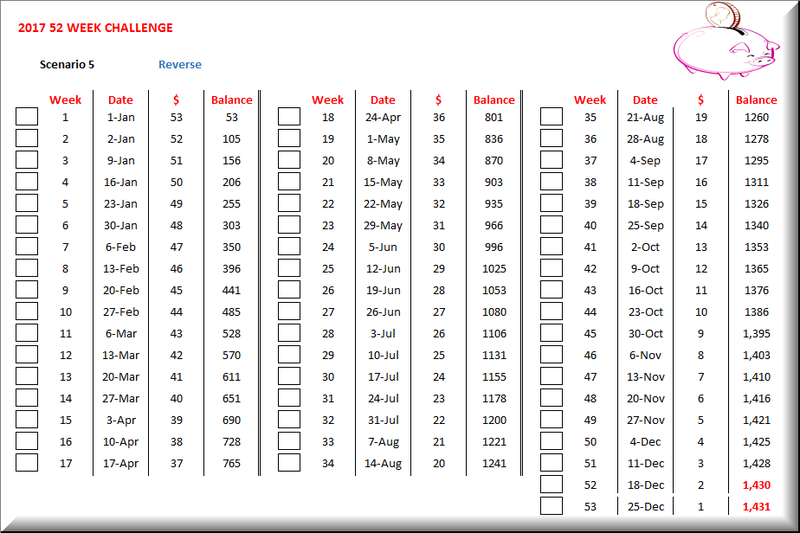 As early as now, I want to share with you the 2017 52-week challenge template as I anticipate things will be very hectic for me for the rest of the year. Scenario 1 is the original 52-week challenge starting from $1 on wk1 to $53 on wk53. This works with SGD because at the end of the horizon you will have 1,431SGD or roughly 48k Php, depending on the exchange rate. Scenario 2 contains a multiplier. Just input the amount you want to be the multiplier and it will auto compute. If I use 10 as a multiplier, wk1 will be 10Php and wk53 will be 530Php. It makes more sense to use this for Philippine pesos because by the end of 2017 you will have around 14k Php in savings. Scenario 3 specifies a starting point. Just input the amount you want to start and the first week will be computed on top of the starting point. For example, if you input 45 as the starting mark, wk1 savings will be 46 and wk53 savings will 98. For this case, ending amount will be almost 4k. Scenario 4 assumes you will save the same amount on a weekly basis. Just input that amount and it will auto populate the information. Assuming you will save 10 on a weekly basis, you will be able to save 520 at the end of the horizon. Scenario 5 contains the 52-week in descending order or reverse order (as shown above) where you will start on wk1 with 53$ and ending wk53 with 1$. This may provide a good motivation for the newbie saver to save consistently and build the discipline of saving. Play around with the template until you find the scenario that works for you. 2017 will mark my 4th year of doing the 52-week challenge. In 2014, I used Scenario 1 which is the original 52-week challenge. In 2015 and 2016, I used Scenario 2 of having a multiplier. Since I was saving in SG Dollar, I used 2 as the multiplier. Starting 3rd quarter of the year, the weekly amount became challenging given the big amount (averaging around 80$ per week). So for 2017, I am thinking of trying Scenario 5 .